One of the great things about hanging around Luang Prabang for a while is being able to get to know some of the special expats who live here. 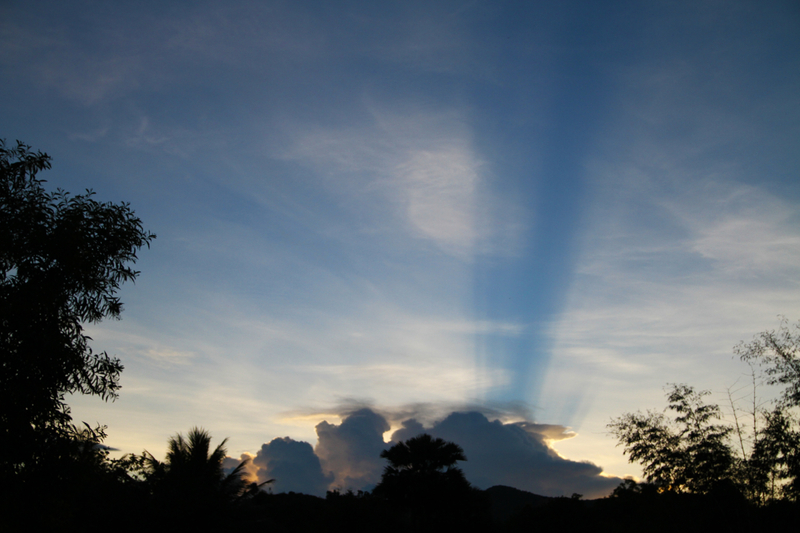 We had just such an opportunity our first week back in Luang Prabang. Ms Emi Weir is the owner of a shop in Luang Prabang and she invited us to go with her to a weaving village outside of Luang Prabang. The name of her shop is Ma Te Sai www.matesai.com which means “where is it from?” The answer to the question is important as her products are made here in local Laos villages and contribute to the local economy. And that brings us to today’s task and the beginning of our adventure. 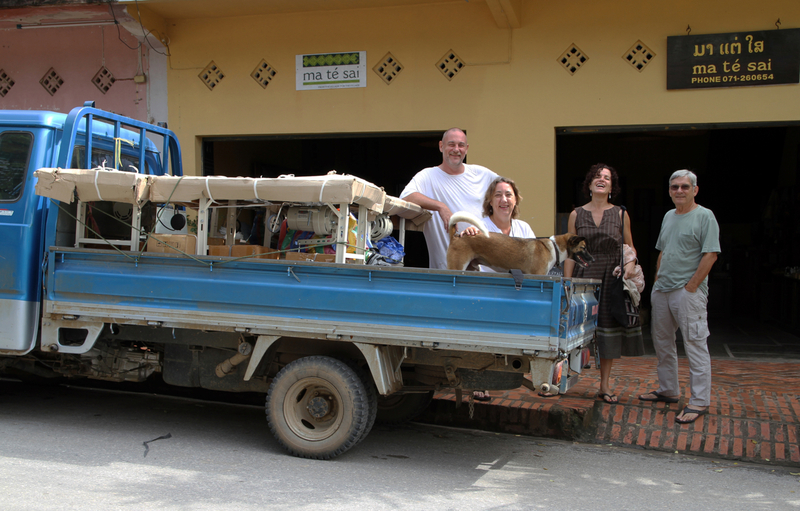 Michel and I will travel with Emi and 4 sewing machines to a village about 3 hours north of Luang Prabang. We will ride in the back of the truck that Emi has arranged for the day with our friend Troy the owner of Hive Bar and Smokehouse. Another important member of the group is Leon, Emi’s dog, who loves to ride in the back of a truck and will entertain us all day with his enthusiasm. 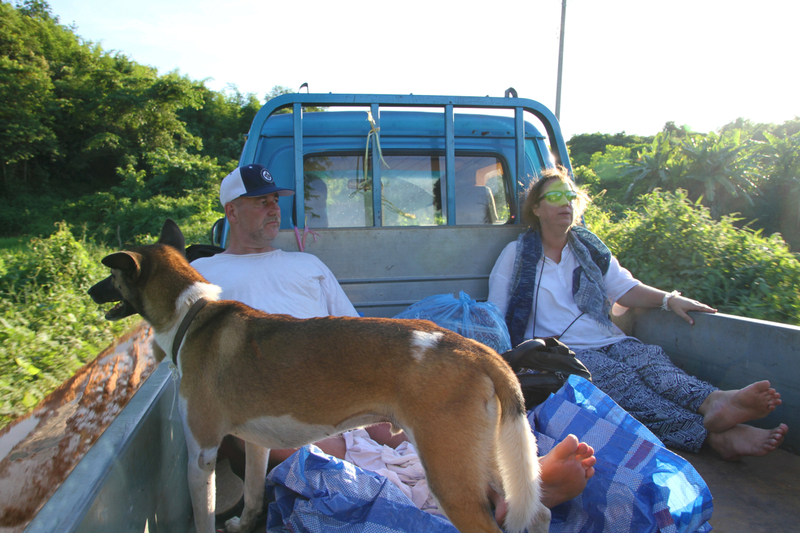 So, the truck is loaded, Leon in position, and Troy, Michel, and I comfortably arranged on cushions in the back. 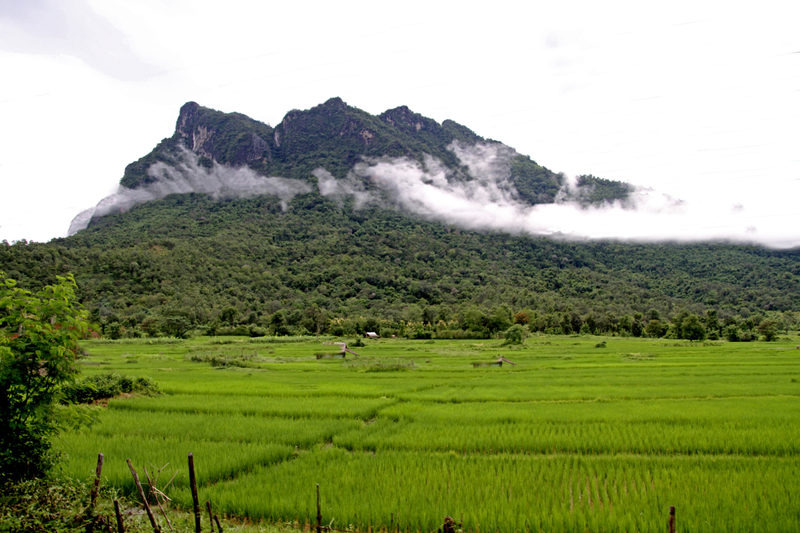 As we drive out of Luang Prabang, along the Nam Ou, and up into the mountains, a feeling of pure joy rises up inside me. Michel and I have recently traveled to some of the most beautiful places in Europe but none of them make my heart sing like this place. 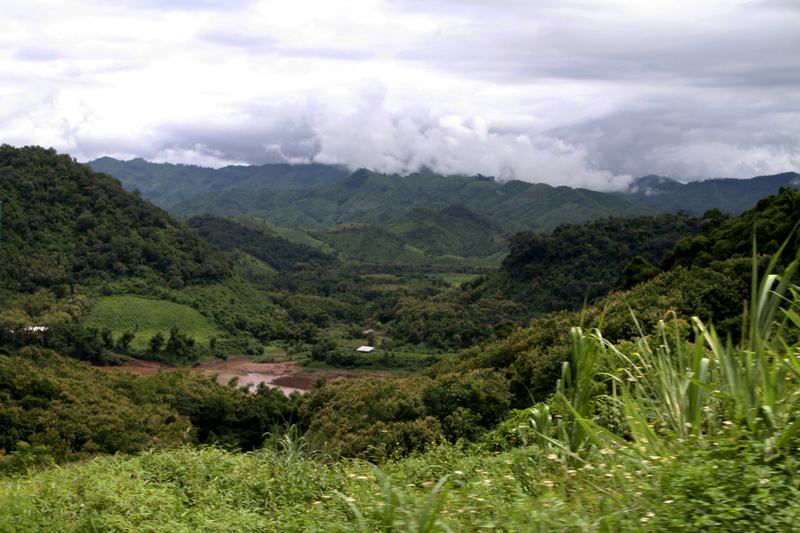 The air is soft and moist, and the surrounding hills are covered by every color of green I can imagine. The rugged limestone mountains are surrounded by rings of clouds and fog that curl around them and yet leave the mountain tops exposed. 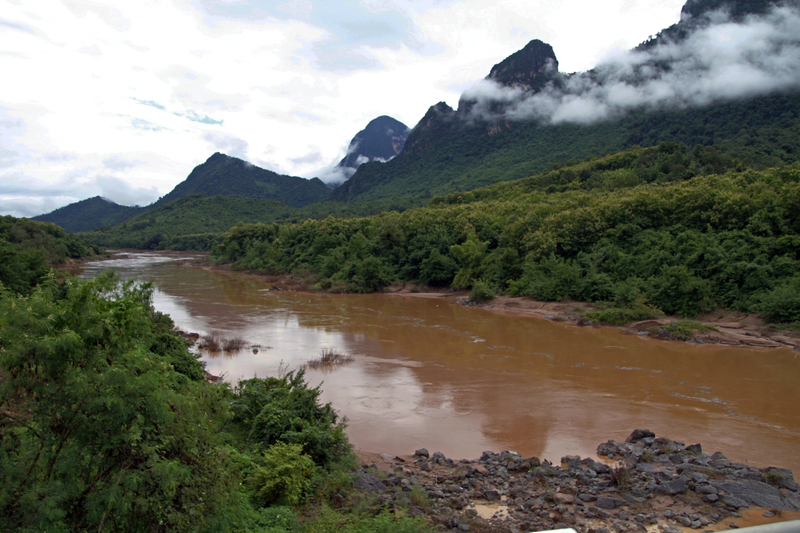 The winding brown Nam Ou river runs along the side of the road and leads us up toward Nong Khiaw but somewhere along the way we turn left and head down a road less traveled. 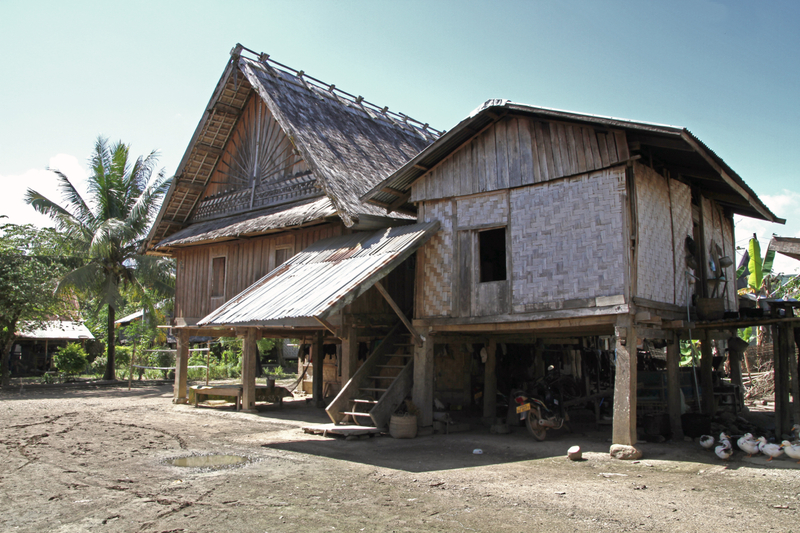 The sun has finally come out and the intense heat of South East Asia is upon us as we arrive at the weaving village. We are greeted and welcomed by a large group from the village. 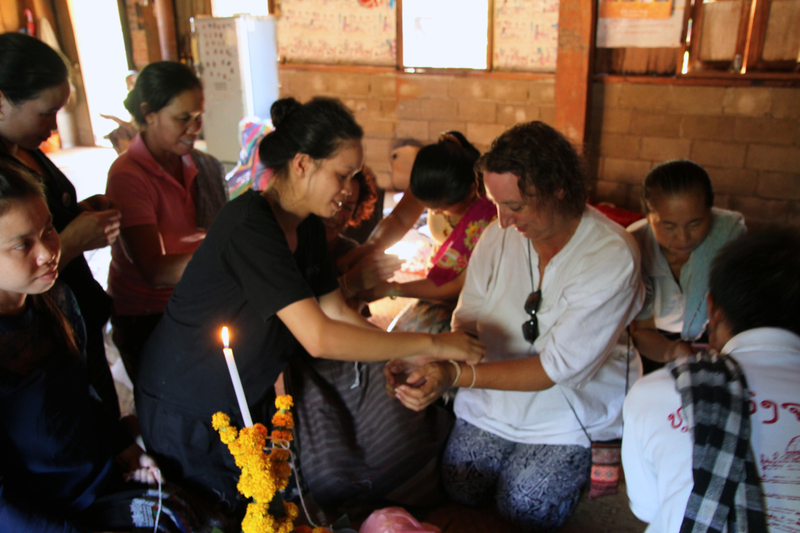 The four women who had attended the sewing classes in Vientiane with their husbands and children are all there. They will each receive a sewing machine today and everyone is excited to see what is in the back of the truck. We are invited into a large house and all settle on the floor together. Emi’s big smile and energetic personality make interaction with all the families in the room easy and fun. She converses comfortably with them in their own language simultaneously translating and explaining to us in english. Wow! A talented lady and she is clearly respected and appreciated by the village people. The village hospitality was wonderful. They served us a great lunch. 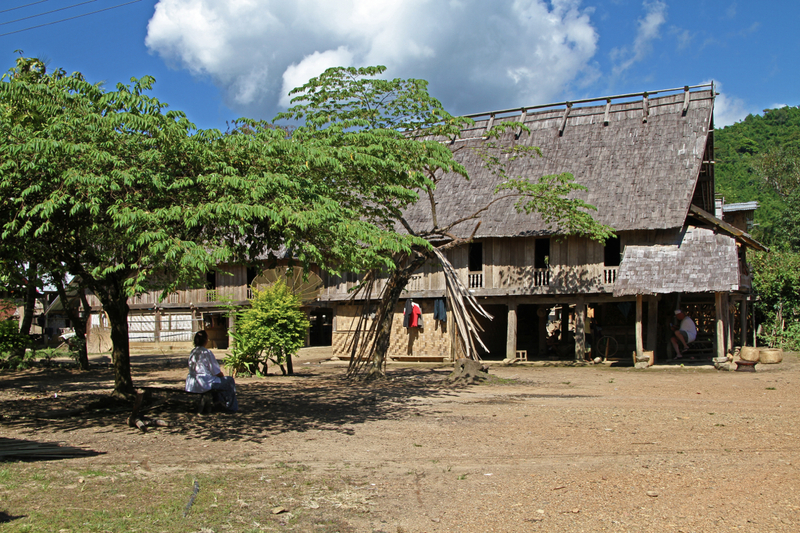 It is unusual to have a group this large welcome outsiders into the village and it represents the importance of the event to the local people. After sitting and chatting for a little while we are all served a wonderful lunch. Before the lunch is served we are each offered a bucket full of water to wash our hands. This is an important custom here as the rice and some of the food will be eaten with the hands. We sit around small tables in groups, local men and women separately, I find myself trying to copy the perfect posture of the local women as they sit gracefully on their legs and feet; they make it look so easy but it is difficult for me to maintain. 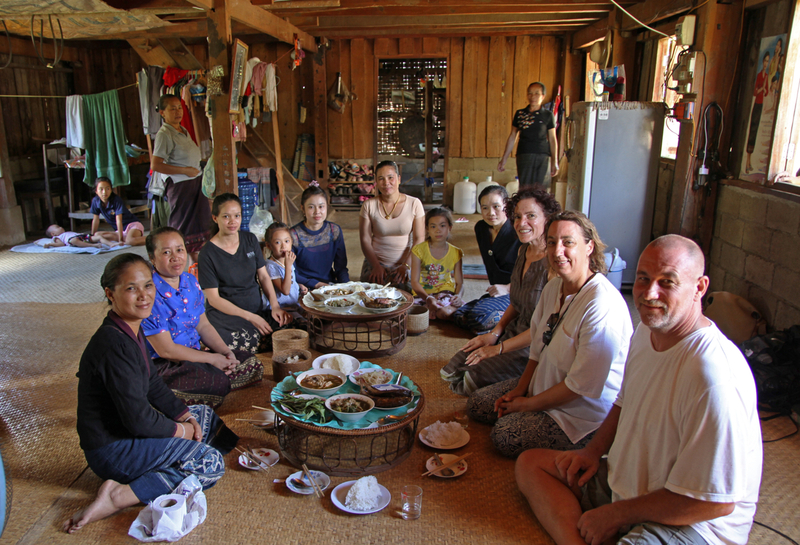 We sit with the village women and enjoy the delicious food. Men sit apart and are served their meal. As guests we are given small plates of our own along with the traditional soup spoon and chopsticks. The locals do not have separate plates but all eat from the same bowls on the table. 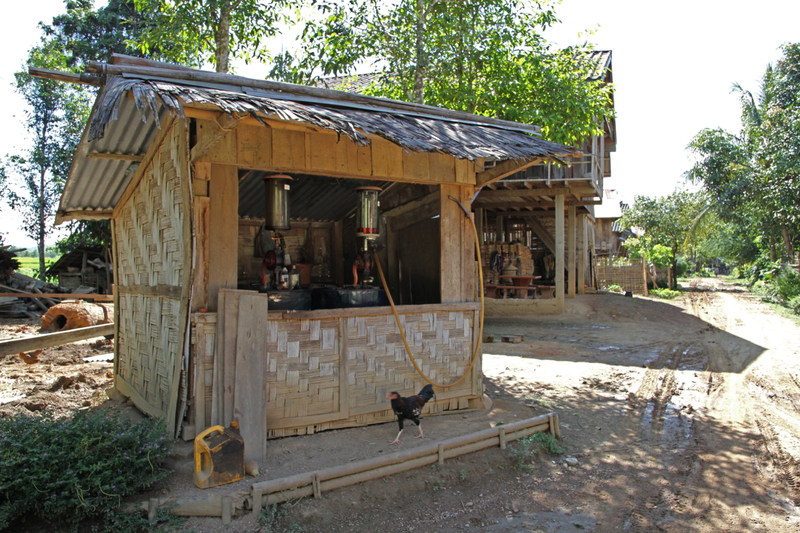 We all share a bowl of steamed rice and a bamboo container of sticky rice, both staples in the local diet. In addition, we have fresh barbecued fish with wonderful flavors of lemongrass and herbs. We share bowls of Tomyum fish soup and another vegetable and meat soup. All delicious. The laughter and conversation continue as we all enjoy the meal together. There is plent of interactions with the childern during the meal. After the meal two of the sewing machines are unloaded, the remaining two we will take to the other side of the village later. We leave Emi to take care of business tasks and begin to wander the village. Emi and the local women coordinate and plan. There is much work to do now. 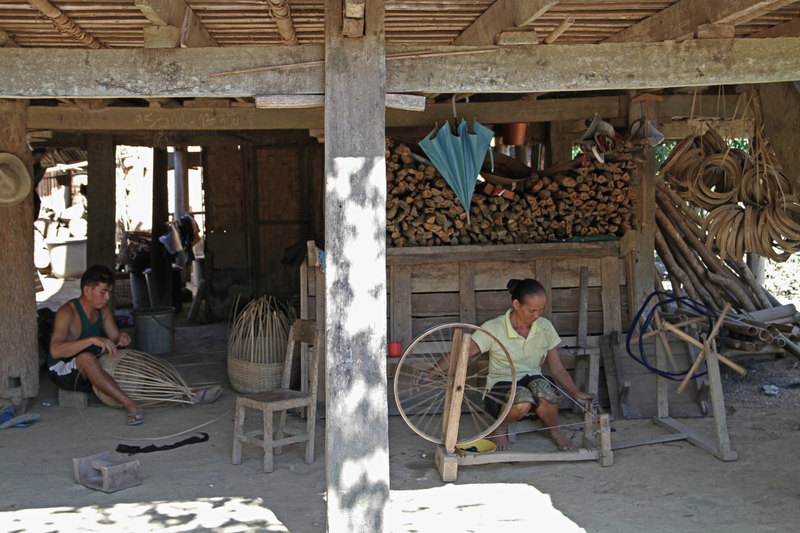 As we wander down the Main Street we observe local women working underneath their homes spinning thread. 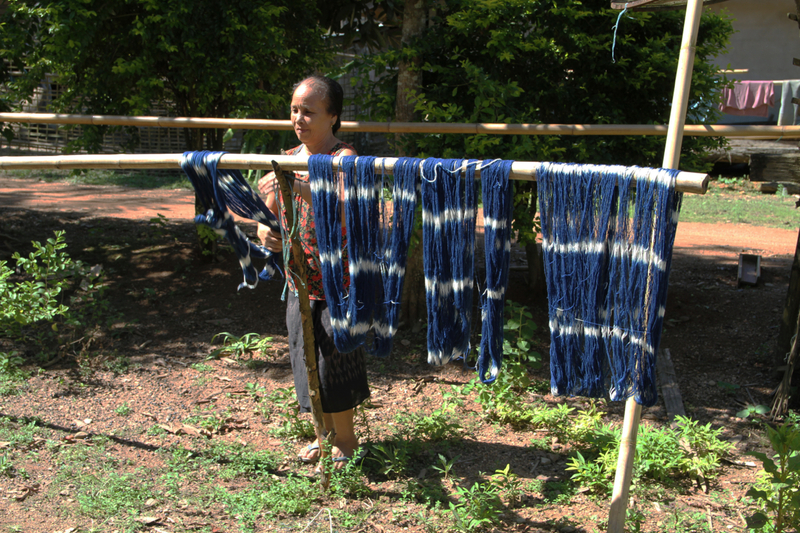 The thread is made, dyed, and woven using techniques passed down from mother to daughter. 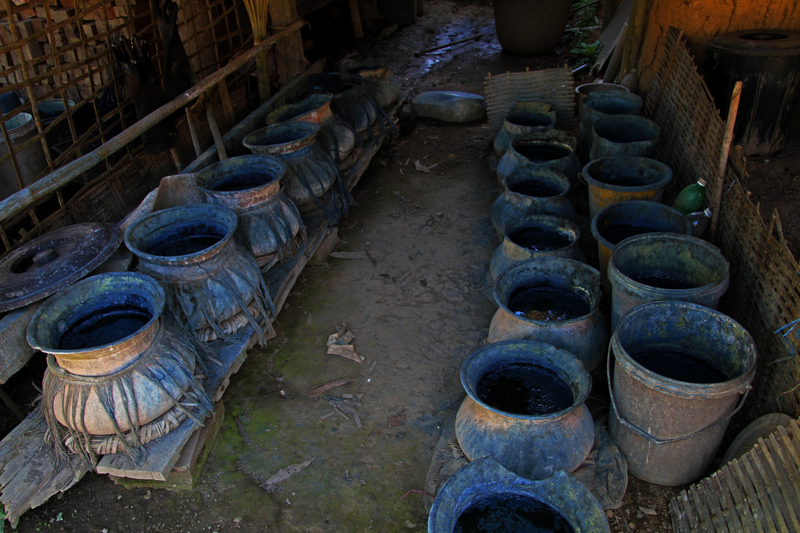 In particular we were able to observe the dying process for the village blue indigo. 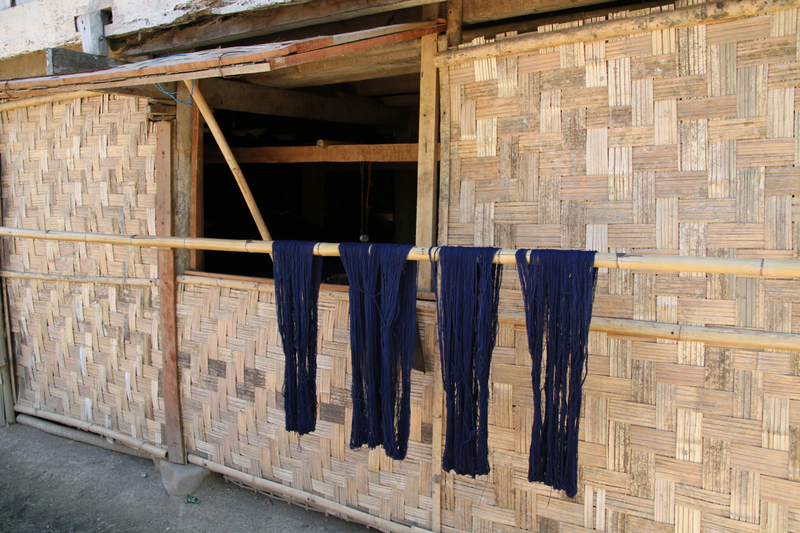 The leaves are picked from plants near the river and then soaked and processed until a blue dye is created. The thread is then dyed and dried. The process uses all local and natural materials. As we walk the streets we observe the local women arranging the thread for drying and I am impressed by the different colors and patterns that I see. 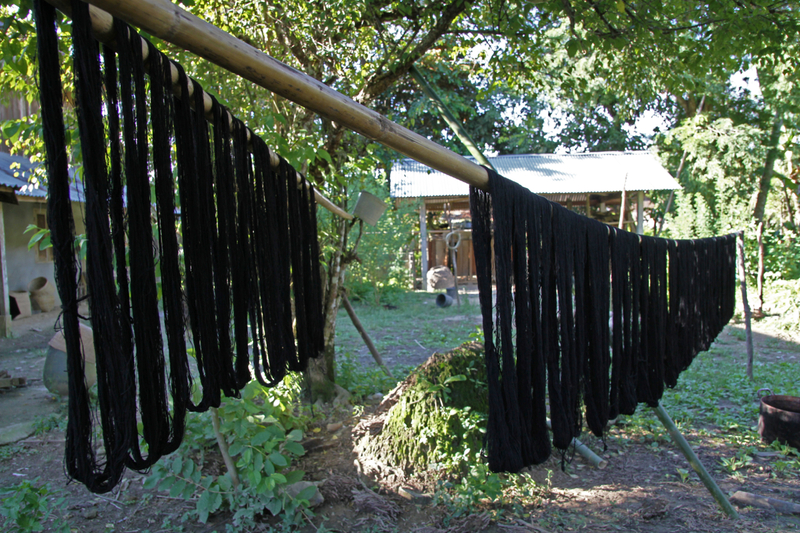 Besides the indigo there is a magnificent black thread hanging nearby. Michel and I are welcomed into one home and the family shows us their finished scarves, all beautifully woven. Michel is using his usual charm to convince the mother and daughter to pose together for a photograph. We all laugh together as he shows it to them and then have even more fun as the father joins the two women for another photo. As the afternoon begins to wind down it is time to prepare for leaving our new friends. 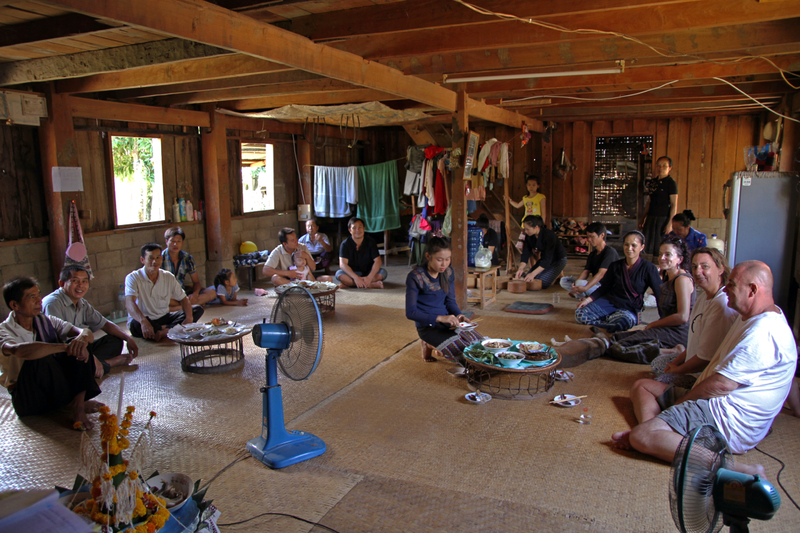 We all sit down again to prepare for the traditional Laos Baci ceremony. An important member of the village leads the ceremony and as he speaks we all placed a hand on a round table covered with food, flowers, and gifts. Then we continue to touch the table and we guests hold a string that is tied to the center of the table. Water is sprinkled on us and then the most heart warming part of the ceremony begins. All the villagers in attendance tie strings around our wrists. It was such a wonderful feeling as each person in the room wishes you health and prosperity. We can feel how warm and lovely these people are on the inside. At the end of the ceremony we are each fed rice and meat so that we do not leave hungry. Then we are each presented with a gift. 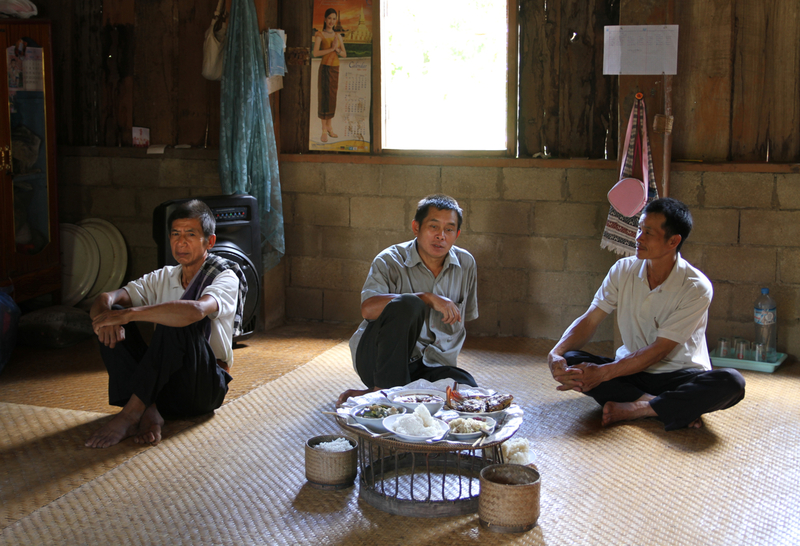 more info on Baci: An ancient belief in Laos that the human being is a union of 32 organs and that the kwan watch over and protect each one of them. It is of the utmost consequence that as many kwan as possible are kept together in the body at any one time. 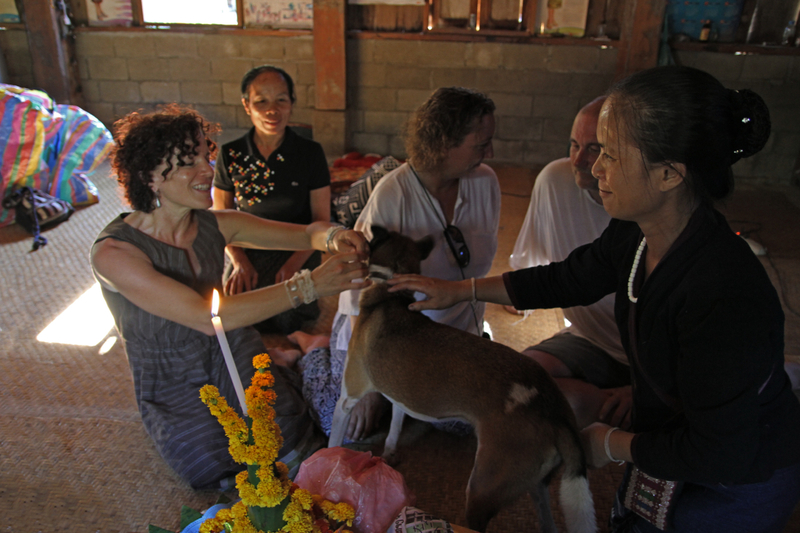 Since all kwan is often the attributed cause of an illness, the baci ceremony calls the kwan or souls from wherever they may be roaming, back to the body, secures them in place, and thus re-establishes equilibrium. Michel and I received beautiful blue and white scarves made in the village as our gifts. Still glowing after spending such a wonderful day with these people we climb back into the truck to slowly make our way home. We do deliver the two other sewing machines, each time sitting with a family and being served water and fruit. 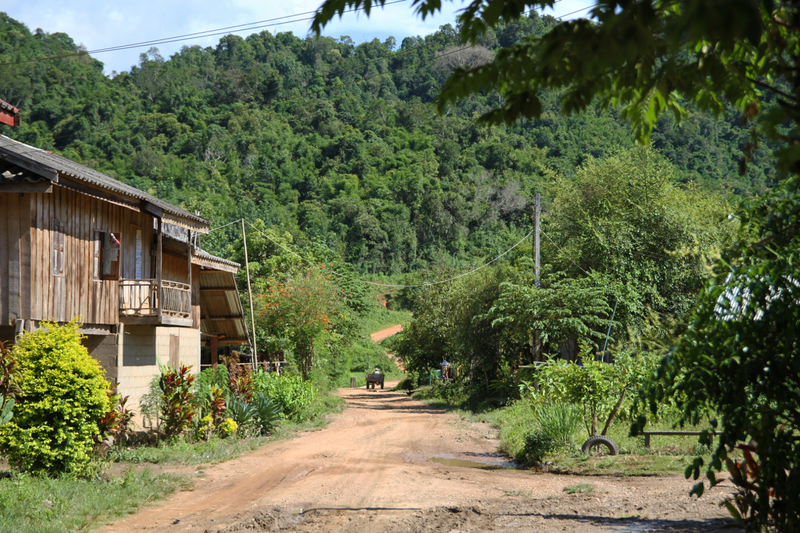 On the way to Luang Prabang. Rough roads and deep pot holes full of water but we all love it. 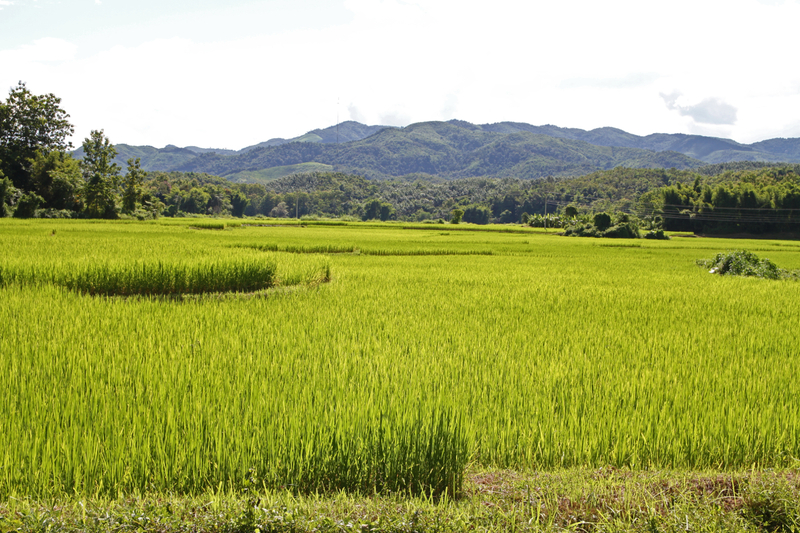 On the way back to Luang Prabang Michel photographs my favorite green rice fields which are perfect this time of year. Claire loves these green rice fields!!!!!! The green seems to go on forever. I am, once again, floating down the road in a state of euphoria. We just spent a day with some of the most gentle and welcoming people on the planet. We are surrounded by some of the most beautiful scenery that I know. The sun slowly sets and we spend several hours driving back in pitch black with no moon. There are no clouds and the Milky Way covers the vast sky like a ribbon of white diamonds in black velvet. As I lay back in the truck I see a star fall out of the sky toward the horizon. Being the greedy girl that I am and hoping the falling star will make me lucky I say: ” I wish for one more day just like this one”. So many people pass through Luang Prabang quickly and don’t have the chance to meet the dedicated people, both expats and locals, who work hard to produce the beautiful crafts we buy and take home after our vacations. Michel and I have a new appreciation for their hard work and who these people are. Take a few extra minutes and stop buy to see Emi while your here. If you are lucky you might get to have a day just like this one. I saw him one day with you and always very interesting, you’ll still see so many wonders. We miss you and love sharing Asia with you. Beautiful description of your adventures and beautiful pictures. It sounds lovely. Glad you are having such a good adventure. Love you and Michel! 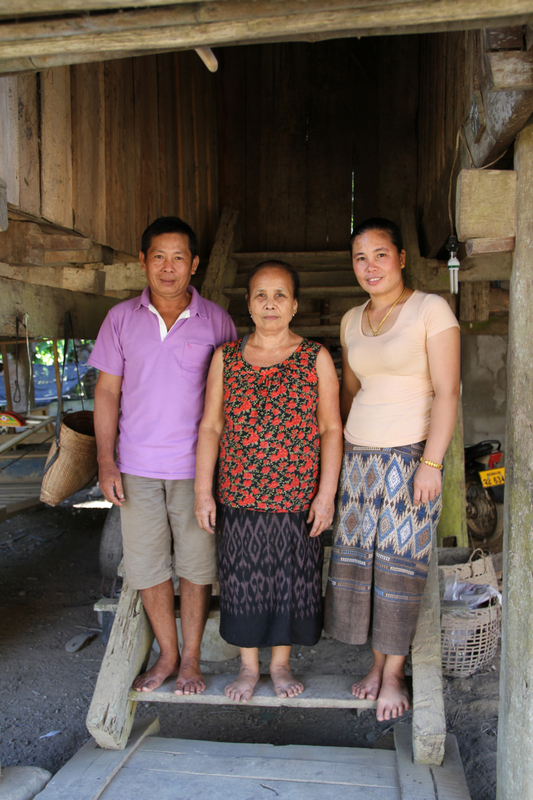 Thank you for sharing this experience, so good to know that there are people helping these villagers preserve their traditional lifestyle! Great photos and a wonderful description of your experience, thanks a million!